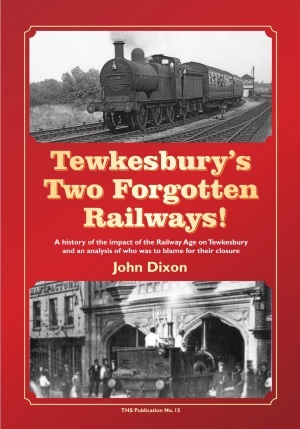 There cannot be much about Tewkesbury's railways which John Dixon has failed to uncover for this wide-ranging work. It's not just a book about trains, locomotives and stations, for a strength of the book is that they are given a social context. I particularly enjoyed the chapter detailing the lives of some of the people associated with the railway across the years and the community they formed along the Ashchurch Road. John's inimitable style keeps the reader wanting to turn the next page to discover more about this episode of Tewkesbury's history which has left little trace on the ground since final closure over sixty years ago. If there is a criticism, many of the photographs could have been larger but then there wouldn't have been so many. The book is a worthy addition to the publications of the Tewkesbury Historical Society. With the support of Tewkesbury Historical Society, John Dixon has published his labour of love – Tewkesbury’s Two Forgotten Railways! It covers the history of our railway age from 1840 to 1961, looking at its impact on the town. It also tries to allocate responsibility for its closure – can we really blame Dr. Beeching? It features both the workers and the locomotives. The foreword was provided by Ian Boskett, and Sam Eedle designed the cover. An illustrated talk on the railways was given by John on 13 November 2018, a book signing took place at Alison’s Bookshop on 17 November 2018 and there will be a guided walk along the Railway’s Remains on Sunday 18th from 11-1pm – starting at Morrisons with a charge of £2 in support of Parkinson’s UK. We hope you will enjoy being reminded of our Railways. THS has also republished Roger Butwell's dvd of the 2011 Commemoration of "the death of Tewkesbury's railways"
5. TRS return of steam 13 Aug 2011. Proceeds in aid of Gloucestershire & Warwickshire Railway, Toddington.